The Schwinn 830 is the base model in the recently redesigned series, joining the up-level 870 as the two residential treadmills currently offered by the company. With a nice array of built in workouts, incline capability, 4 user profiles and easy folding, the 830 has become quite popular, especially given its attractive price when on sale. 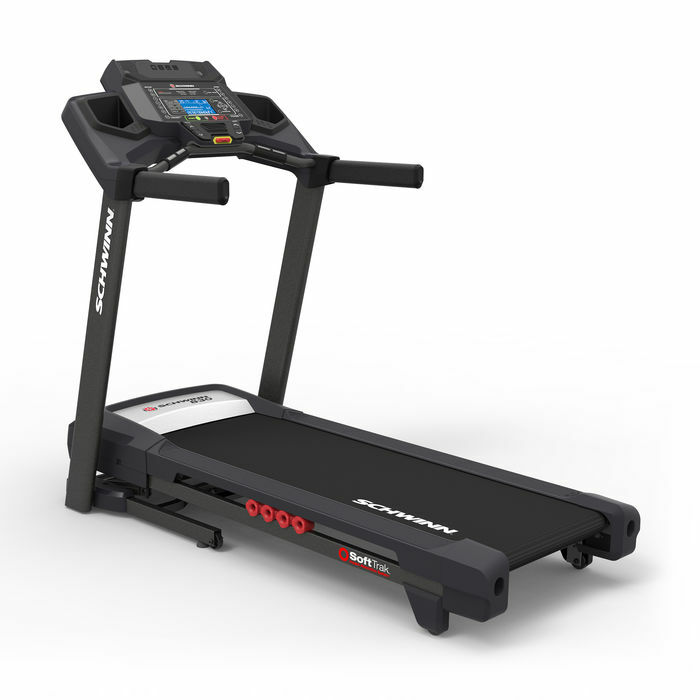 Speed : 0-12 mph 1-Touch This is a common feature on NordicTrack treadmills. You have 12 buttons on the console to change speed with just 1 button push. You also have 2 up/down arrows to change speed by 0.1 or 0.5 increments. One thing that you can always count on from Schwinn and sister company Nautilus is a large amount of built in workouts to keep things interesting. The Schwinn 830 comes with an ample 22 workout programs, including 5 heart health, 3 interval, 5 training, 3 weight control, 3 quick, 2 custom and one manual. Between all of those you can really change things up from one workout to the next. The 830 comes with SoftDrop Folding, which allows you to easily fold up the machine with the touch of a button. You can then store the machine anywhere you’d like using the transport wheels. The Schwinn 830 features the company’s patented Softrak cushioning, also found on the up-level 870 model. The belt is 1 ply and 1.5 mm think and supplies ample support and give at precise points during your stride. The company recently made the console more streamlined and intuitive, and it’s certainly an improvement on previous models. You have a high resolution blue backlit LCD screen, built in speakers, a place for your tablet that doesn’t cover the workout stats and a USB port for charging your devices and syncing your results to your favorite fitness apps. The Schwinn 830 bumps up the incline capability to 12% from the previous 10%, has a stronger 2.75 CHP motor, an adjustable three speed fan and a water bottle holder. There’s plenty to like on the new Schwinn 830 treadmill. They have definitely stepped it up and delivered a much more modern, sleek machine. You have the new console, a ton of built in workouts, good cushioning, incline capability, USB tracking, easy folding and heart rate monitoring. It can also be transported easily, weighs less than previous models and is easily assembled. The only real drawback on the Schwinn 830, and most of the company’s cardio equipment for that matter, is the warranty. You only get 10 years on the frame, compared to lifetime on most other treadmills you will find in this price range. You also only get 2 years mechanical, 1 year electrical and 1 year labor. That’s really the only thing that holds us back from recommending this treadmill, and it’s a shame because it really does have so much going for it. 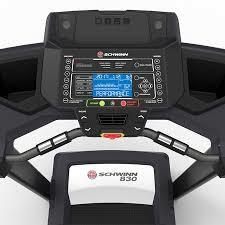 If you’re looking for a good treadmill under $800, the Schwinn 830 is definitely worth a look. You get plenty of nice features and capabilities. A better option is its big sister, the Schwinn 870, which gives you more workouts, a more powerful motor, more incline, an enhanced display, Bluetooth capability, the Schwinn Fitness Score, a thicker and also longer deck and an even more advanced cushioning system. For only a few hundred dollars more, it’s well worth the leap. If you do buy either Schwinn treadmill, make sure you get the extended warranty to cover yourself in case you encounter any issues down the road.